Michelle Clavette is a lady angler that has been fishing since she was about six years old. She remembers that the first fish she caught was a catfish from a canal. That catfish got her addicted to the thrill of feeling the tug of the line. She is a must follow on Instagram! There is a link to her page at the end of this post. Michelle lives in South Florida, but often goes to Bimini and other locations to pursue her passion as an angler. She simply loves living in South Florida, because it allows her so many angling possibilities so close to home. She enjoys basically being able to step out of her house and start catching fish. Michelle has fished in several tournaments. 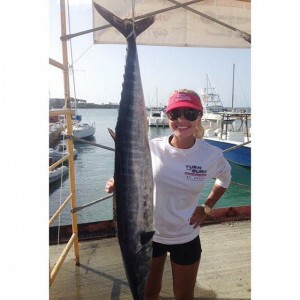 She finished in first place in a 2014 tournament in Saint Croix. She has desires to fish in more competitions in the future. She loves to travel and fish, so she often combines the two! She has fished most of the waters of Florida. She has traveled to Central America and several Caribbean Islands to follow her angling dreams. Michelle takes pride in respecting the fish. She follows all the rules, because she wants future generations to have the joys of hitting the waterways with their families as well. Michelle also loves to cook and eat her catch. She is a firm believer in eat what you keep and let others go to fight another day! Way offshore or nearshore, this lady angler gets the job done! Dolphin (mahi mahi), swordfish, snapper, and cobia better swim the other way when this superstar hits the water. Michelle takes great pride in teaching others about the joys of fishing. She loves it when she sees the excitement of a new angler battling a huge fish for the first time. Her passion for this sport has led her to be sponsored by Pelagic Gear. Make sure to follow Michelle Clavette on Instagram (IG). Her name on IG is @bombchelle811!